When you travel to or from JFK, it is a good idea to make everything as easy on yourself as possible. From the quickest way to book your flight to the most efficient way to get from the airport to your hotel, it is all about making life simple. The simpler the process, the less that can go wrong. That is why you should consider booking JFK airport parking in advance, and make one more step in the process easy and worry free. Looking for LaGuardia airport parking? Though John F. Kennedy International Airport (JFK) is one of the busiest airports in the United States, there are less than ten airport parking lots at which you can reserve a spot ahead of time. New York’s John F. Kennedy International Airport, most commonly known by its airport code of JFK, is the busiest entry point in the country for people entering the United States from foreign destinations. The airport lies in Queens, southeast of Manhattan, and is the home base for JetBlue Airways. 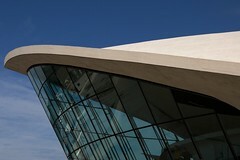 JFK is also a hub for American Airlines and Delta Air Lines, and a focus city for British Airways and United Airlines. There is no shortage of stores and restaurants to keep you busy while you wait for your flight, and because of its importance as an international entry point there are also many currency exchanges and cell phone rental opportunities as well. For traffic information, see the NYC TMC website. Planning a long drive to or from the airport, or an odd-hours flight? Check out New York Airport (JFK) park and sleep hotels. Don’t fancy driving to the airport? Or leaving your car there and paying for parking? Catch a shuttle to JFK airport.